But oil revenues still account for 96 percent of the country’s revenues, so as government fails to collect an adequate amount of money from its oil business, it has failed to provide an adequate amount of services for its citizens. Due to hyperinflation — the International Monetary Fund estimates Venezuela’s inflation rate will reach 1 million percent this year — food shortages and high prices, 93 percent of the population does not earn enough to buy food, according to a 2017 study conducted in Venezuela. Venezuelans have lost, on average, 20 pounds since the country’s humanitarian crisis began in 2015. Runaway spending, price controls, nationalization of companies, corruption and the end of the rule of law — it’s been a master class in how to destroy an economy. The goal of Maduro’s alleged constitutional reforms is to no longer have a constitution worthy of the name. Immediately after the vote, his forces arrested two leading opposition figures in the dead of night. Video shows one of them, Antonio Ledezma, being taken away in his pajamas and another, Leopoldo López, bundled into the back of a car. It looks like what it truly was — a pair of kidnappings. Denied the ordinary means of dissent via the press and elections, the opposition has taken to the streets. Already more than 100 people have been killed in clashes over the past several months. Venezuela is crumbling and with it, the left’s idea of a perfect socialist system. Yet … Nicolás Maduro, refuses to realize this obvious fact and instead, has resorted to political violence to silence his opposition. As the economy crumbles, the future of the oil industry Venezuela once relied on has been called into question. The devastation in Venezuela has grown from a political crisis to both an economic and humanitarian one. During a vote last month, the Venezuelan people were asked to select, from a trusted list of allies in the governing party, a group to rewrite the nation’s constitution and maintain power in Venezuela until their work is finished. This would give Maduro and his ruling party the authority to dissolve branches of government such as the legislature, which is currently controlled by Maduro’s opposition party. Voters were not given the ability to reject the plan, simply decide who they wanted on the council. The list was so corrupt it included Maduro’s own wife. While Maduro boosted high voter turnout, the election results have already been called into question. Opposition spokesman Vicente Bello, criticized the lack of voter protection practices, such as the fact that voters were not asked to give proper identification. Voters were only allowed to cast ballots in any of three different locations. Even a software company involved in setting up voting systems announced the turnout figure had been altered by at least one million votes. 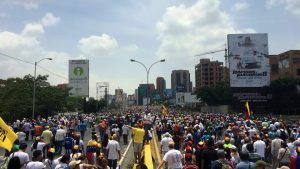 While Venezuela is clearly operating under an illegitimate democracy, the situation only gets worse as Maduro responds to opposition with force. Following the election, two opposition leaders under house arrest, Antonio Ledezma and Leopoldo López, posted videos to YouTube urging Venezuelans to protest the election results and called the newly formed council a fraud. Within days, both individuals were imprisoned for making political statements. The Trump administration has quickly imposed additional sanctions on President Maduro as a result. Trump hopes this encourages the release of all political prisoners held there. But these two are not the only Venezuelans suffering. Venezuela has continued to fall apart, and this has become more and more noticeable to many this year. Venezuela’s oil wealth and geographic location had the potential for it to be one of the most prosperous countries in Latin America. Despite the drop in oil prices, it still should be. However, various government policies have not served the people well. And now, government leaders are taking desperate measures to keep power. Eventually, Venezuela will one day align with the Beast power that will arise in Europe. That, too, will not be good. Venezuela, and the rest of the world, needs the Kingdom of God for the coming utopia (watch also Millennial Utopia). This entry was posted on Thursday, August 2nd, 2018 at 3:00 pm	and is filed under Prophecy.